Have you stocked up on extra food and water? Have a flashlight and plenty of spare batteries? 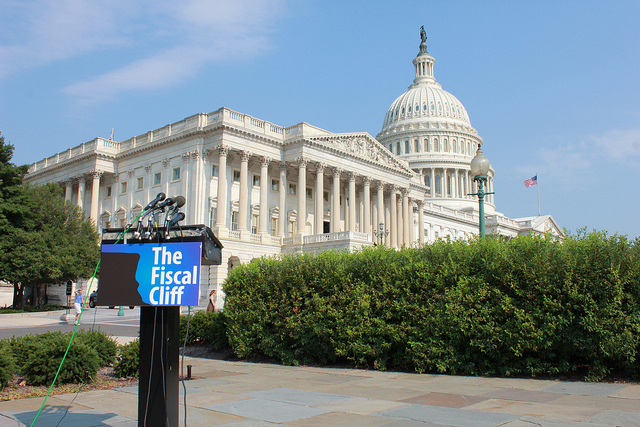 The Fiscal Cliff is nigh, and much of Washington is fearfully counting down the days. With all the hype, and the Wile E. Coyote-evoking image of the cliff, it’s hard to remember that the potential year-end hit to the economy is not an act of nature or something forced on the United States by cruel outsiders. The Fiscal Cliff is instead a crisis manufactured by a divided Congress that doesn’t trust itself to do the right thing in the absence of a crisis. So, absent a financial deal between the two parties, we’ll get hit with a bruising double-whammy of higher taxes and automatic cuts to government spending. As a form of motivation, it’s both brilliant and perverse, like a diet that requires you to shoot yourself in the foot in three months unless you have started running daily. As for the backstory, each faction in this drama has its own partisan CliffsNotes (sorry, couldn’t resist), but some facts are unassailable. The first is that democracies have an easier time raising spending than they do raising taxes, especially when credit is readily and cheaply available, as it has been these past few years. Second, federal deficits of the past three years have been alarmingly high (this year’s is projected to come in at more than 7 percent of Gross Domestic Product), and they contribute to a mounting national debt (now in the neighborhood of 100 percent of GDP). And the third unassailable fact, confusingly enough, is that Washington’s biggest problem in dealing with its fiscal mess may be that financial markets don’t appear to think there is much of a problem. Before delving into that last head-scratcher, step back and consider the overall pie. Over the past 40 years, federal tax revenues have averaged 19 percent of GDP. This percentage, measuring the slice of the overall economy claimed by Uncle Sam, has held remarkably steady, despite dramatically varying policies and tax rates (top marginal rates were well over 50 percent for much of the postwar era). Only once, in the capital-gains-rich year of 2000, did tax receipts exceed 20 percent of GDP. Federal spending, meanwhile, has averaged about 22 percent of GDP over the past 40 years. In the past few years, we’ve deviated from these trend lines, as the so-called Great Recession dried up tax revenues and necessitated extra spending. The amount Uncle Sam is currently hauling in amounts to only 17 percent of GDP, while Washington is spending an amount equal to roughly 24 percent. The long-term projections look even grimmer, on account of the coming spike in entitlement spending produced by an aging population and escalating healthcare costs. So, to recap, we’re having a hard enough time as it is getting back into equilibrium (defined not as balanced budgets but as manageable deficits in the range of 2 to 3 percent of GDP). But in the long term we’re in even bigger trouble, as federal spending is projected to creep past 30 percent of GDP in the next 20 years if current entitlement obligations and costs—or economic growth rates—don’t change dramatically. Jumping off the cliff addresses the short-term problem by raising revenue (via the expiration of Bush-era “temporary” tax cuts) and by implementing severe budget cuts. Great idea—unless, as economists are quick to caution, the economy contracts as a result of this self-imposed austerity and starves the government of the additional revenues it was hoping for, which would give us a short-term fix but bring us no closer to solving the longer-term crisis. Mind you, that word “crisis” is one I use advisedly because, as teased earlier, the financial markets have remained nonplussed by the scary fiscal projections, credit rating downgrades, the political dysfunction, and the alarmist countdowns. Despite all of these red flags, it’s never been cheaper for Uncle Sam to take out a 10-year loan than it has been this year. The interest rate on the 10-year Treasury bill dipped below 2 percent earlier this year, an all-time low. Countless future economics Ph.D.s will be minted seeking to explain how and why Uncle Sam’s cost of borrowing could have kept going lower as the federal debt burden (and indicators of federal dysfunction) kept shooting higher. Among possible theories: The United States still looked like a sound investment when compared to places like Europe; controlling the world’s reserve currency allowed Americans to have their cake and eat it too; a soft economy allowed Uncle Sam to soak up excess available cash that the private sector (and foreign central banks like China’s) didn’t want to invest; no one wanted to count out a nation capable of inventing a Fiscal Cliff to try to spook itself into getting its act together. I would even offer up the Micawber Theory, a nod to the hard-up Dickensian character in Great Expectations who always believes “something will turn up” to transform things. We’re still considered, by domestic and foreign lenders, to be a charmed nation with a knack for coming out ahead—in short, a good credit risk. Whatever the reasons for the stubbornness of the market’s confidence in Uncle Sam, we’re a long way from the ’90s, when Treasury Secretary Robert Rubin could point to an uptick in interest rates to insist that the administration and Congress get serious about embracing fiscal responsibility. While both parties at the time bought Rubin’s argument that government borrowing needed to be reined in because it “crowds out” borrowing by consumers and businesses, Republicans later took to mocking “Rubinomics” when they became the party of large deficits under President Bush. Democrats on the left don’t feel too differently. All of this is maddening to Wall Street and Washington budget hawks (among whom I count a number of colleagues and friends), who understandably want us to live within our means and believe there will be dire consequences if we don’t. A couple of years ago I teased a budget-hawk colleague that she must, in her darker moments, wish for signs of inflation in order to get us all on the program. Of course, she denied having such hopes—and reminded me that it’s easier for you to get your house in order before a crisis forces you to do so. True, no doubt, but so difficult in a democracy (see “Global Warming, responses to”). That’s why the smart money in Washington is on some short-term compromise at year’s end or in January—to buy some more space and time to procrastinate on any of the really hard stuff. Keep an eye on interest rates and the stock markets, for any real urgency to make meaningful decisions can only come from them. And what about “the people” beyond the Beltway, the great American electorate that hired both President Obama and the Republican House? Voters are routinely mocked by Washington insiders and media elites for being out of touch with reality, for expressing concern about deficits but no real appetite to pay more taxes or to identify any material cuts to government programs. But does this make them naïve and spoiled, as is often assumed in my circles—or wiser? Could it be that most Americans look at the petty insider game and are right to scoff at the choices laid out by keepers of the conventional wisdom? Maybe the American people keep electing a divided government so as to neutralize Washington while something else, something more ambitious and becoming of America, turns up, as Micawber would say. One game-changer that could alter all dire scenarios would be a combination of higher economic growth and declining healthcare costs. The healthcare sector has proven resistant to the efficiencies that new technologies have forced on most other industries, but is it crazy to think that could change? For now, either way, the cliff is upon us. It may turn out to be as anticlimactic a crisis as Y2K, or it may yet trigger a panic. Living inside the Capital Beltway, though, I would be rude to pretend that the sanguine financial markets and disinterested American public were onto something my neighbors and colleagues are not. I should probably stock up on extra water, if only for the sake of appearances. Andrés Martinez is the editorial director of Zócalo Public Square and a vice president at the New America Foundation. *Photo courtesy of Talk Radio News Service.